Update: The giveaway is now closed. Also check out the 2013 Wishlist here. This is the sixth year I am writing the Wishlist of Books for Nonprofit Folk which has grown and grown since its inception. I am unabashedly proud of this diverse, curated list. This year, for the second year in a row, the Terry McAdam Book Award winner will be the featured book and giveaway book on the list. Kivi Leroux Miller has graciously agreed to offer her award winning Content Marketing for Nonprofits: A Communications Map for Engaging Your Community, Becoming a Favorite Cause, and Raising More Money as a giveaway for the post. I also extend a huge thank you to the nonprofit thought leaders who contributed to this list. They are Debra Beck, Kathleen Brennan, Heather Carpenter, Linda Czipo, Pamela Grow, John Haydon, Beth Kanter and Marc A. Pitman. What a stellar list of contributors! I publish this list at this time of year because I think a book is the perfect holiday gift for that someone special in your nonprofit network. Any of these books would be a very thoughtful gift. 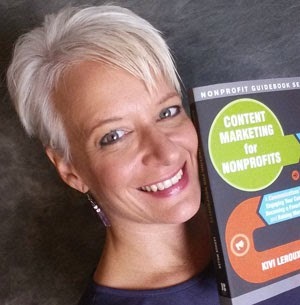 First up is Content Marketing for Nonprofits: A Communications Map for Engaging Your Community, Becoming a Favorite Cause, and Raising More Money which is the giveaway this year compliments of the author, Kivi Le Roux Miller. the most inspirational and useful new book published which makes a substantial contribution to nonprofit management. The Chair of the 2014 Committee, describes Kivi’s book as “a fun and insightful read that guides the management of nonprofit organizations to integrate marketing and communications with community engagement, fundraising and programmatic services. It provides the approach with both depth and practical application and examples.” This is a must have in any nonprofit personal library. Details to enter the giveaway are at the end of the post. Visit Kivi’s website here. Linda says, “It offers a wide array of tips, techniques, exercises, etc., to strengthen public speaking skills in a variety of situations. Even if you only use a fraction of the information, it will improve your effectiveness as a speaker. This is a comprehensive resource which will give a nonprofit the framework they need to make decisions for sustainability and help leaders address the challenges inherent in balancing mission impact with financial viability. This book is a successor to the authors’ Nonprofit Sustainability: Making Strategic Decisions for Financial Viability which has been one of the most popular books on last year’s list. (Yes, I know that.) It is loaded with useful figures, tables and templates. Forrester makes a clear and compelling case for the value of reflection in organizational life. Embracing the role of pausing, reflecting, and digging deeper to address the underlying issues being considered increases the potential for both higher-quality board decisions and higher board member satisfaction and motivation. There are a zillion fundraising books out there but these books have been recommended by top fundraising experts. I am so happy to see two of them aimed specifically at small nonprofits. Straight to the point, Pamela says, “Fundraising really is everyone’s job. That’s why I loved Andrea Khilstedt and Andy Robinson’s new book.” See Pamela’s review here. Pamela says, “Ask anyone what the biggest problem in nonprofit fundraising is and the statistics don’t lie: donor retention….should be on every fundraiser’s bookshelf. See Pamela’s review here. Pamela also provided a link to her post: Five Great Non-Fundraising Fundraising Books. Click here to see Pamela’s list. Also by Marc and not on a previous wishlist…..
We all know that nurturing relationships is important to nonprofits but do you know how to do it on Social Media? Here’s the how-to resource guide for you. Derrick and Kara are the premier researchers on what makes Millennials tick when it comes to nonprofits. I have been writing about their reports and annual conference for the last few years and this book has been on the Wishlist for Nonprofit Folk Pinterest Board for quite some time. Millennials do things differently than older generations and if you want to connect with them as volunteers, supporters and donors you need to understand how they relate to nonprofits. Here is a link to Beth Kanter’s excellent full review of this book. My thanks to all of the thought leading contributors for sharing their recommendations with us and a special thank you to Kivi Leroux Miller for offering her highly acclaimed, award winning book as the giveway for this year’s post. 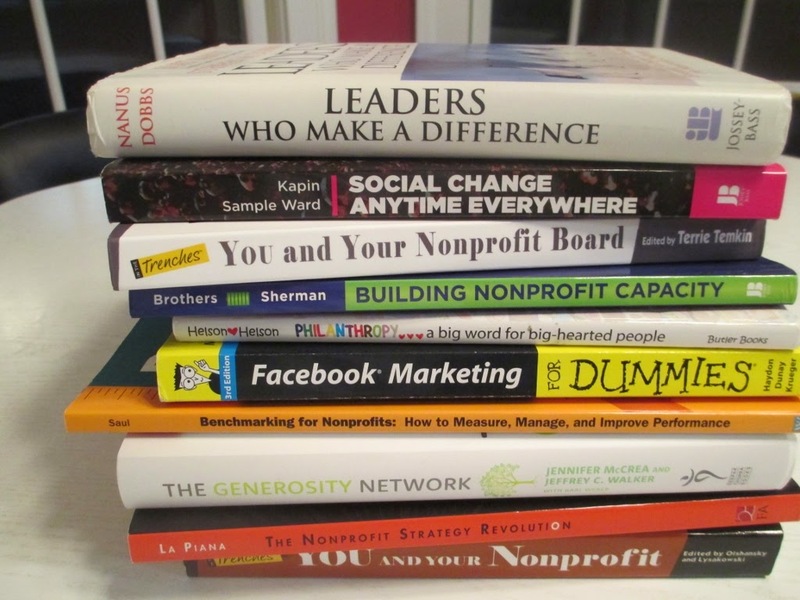 If you would like an opportunity to win a copy of Content Marketing for Nonprofits just leave a comment here about the list or add a book you would recommend. Another way to enter is to visit the MarionConway – Nonprofit Consultant facebook page and leave a comment on the post about this giveaway. The winner will be chosen from comments made by midnight, November 28, 2014. If you enter the giveaway, please email me your email address so that I can contact you if you are the winner. All of these books are at Amazon. Just click on the title below and you’ll be at Amazon. Thank you for the great list, I've been eating, breathing and living non profit for several months now as I gear up to become an Executive Director of one. I'm looking for all the help I can find! I have worked in the nonprofit sector for over 25 years and it is great to see so many resources to help the sector. If there are any good books about going from a primarily government grant funded np to one that runs business ventures to help shrink the dependence on shrinking government funding, I am all ears. Thanks so much for including The Essential Fundraising Handbook for Small Nonprofits on your list. It was great fun working with such a super crew of fundraisers! This is a terrific list which I hope to peruse over the next 6 months. From content to financial sustainability, it covers a lot of ground of concern to small non-profits. Thanks for the list. I would add Mobile for Good by Heather Mansfield to this list. She wrote a great guide to using mobile and social media to fundraise. I'm very new to the non-profit world after many years of higher ed marketing. This list is a great help to me as I build my knowledge and resource base! Thanks for sharing such a broad, all-encompassing list. I'm currently helping to build a foundation, and also getting ready to start my own small business and I think these will be invaluable to both!